I bought one of these $60 (after rebate) laser printers in 2007, and liked it so much that I bought a second one for my mother a few months later. THE $20 OFF CODE AT THE BOTTOM OF THIS POST IS VALID ONLY ON 2/14/2009. If you want this printer deal, then you have to act fast. Y’all probably know that laser printers are much cheaper to operate than ink-jet printers. Typically LaserJet pages cost about about 2-cents per page for laser toner versus twice as much for inkjet ink. Sure, I understand that you may use an inkjet printer because you want (or need) color printing, but at $60, you may want to consider adding this cheap laser printer to your office, since it will likely pay for itself in what it saves in printing costs versus your inkjet printer. No matter which methods I’ve used to preserve the inkjet cartridge, if I didn’t use the inkjet printer for a few weeks then the cartridge would become dried and useless. I’ve never been keen on refilling my own inkjet cartridges and it’s well known that printer companies charge excessively for replacement ink cartridges. If you have similar problems with your inkjet printer cartridges drying out, you may want to consider trying this wonderful $60 laser printer from Brother. 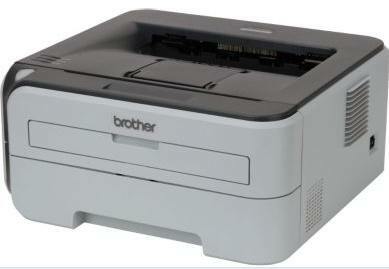 I own a couple of fancy printers, but I also own two Brother printers that are very similar to this one. I bought the first cheap monochrome (black and white) laser printer a few years ago to replace a color inkjet printer I used occasionally when visiting our vacation home (which nearly always needed a cartridge replacement from drying out as a result of infrequent use). The cheap Brother laser printer performed so well that I bought another for my mother. It has performed well for her, too. I paid about $60 (after rebate) for my Brother Laser printers in 2007. The model at the link below is a bit nicer than the ones I bought; The printer has built-in 802.11b/g and ethernet network interfaces so you can share this printer with others on your computer network or to print wirelessly from your notebook computer. If you don’t want to connect this inexpensive computer to your network, you can just connect it to your computer like any ordinary printer. This cheap Brother laser printer features a print speed of up to 23ppm with a maximum resolution of 2400 x 600 dots per inch. As is with most of the deals I post, supplies are limited and if you snooze, you lose. Pay $130. Use $20 off code 46289 at checkout (expires 2/14). Mail in Rebate $50. With free shipping your net cost is only $60 for this good quality, inexpensive (refurbished) laser printer. Laser printer (with Network printer sharing) Only $60 with free shipping (after rebate). Click Here. P.S. For more deals like this one, follow me on TWITTER.